A small and floating run-of-the-river power plant in Austria. Run-of-the-river or ROR hydroelectricity is considered ideal for streams or rivers that can sustain a minimum flow or those regulated by a lake or reservoir upstream. A small dam is usually built to create a headpond ensuring that there is enough water entering the penstock pipes that lead to the turbines which are at a lower elevation. Projects with pondage, as opposed to those without pondage, can store water for daily load demands. In general, projects divert some or most of a river's flow (up to 95% of mean annual discharge) through a pipe and/or tunnel leading to electricity-generating turbines, then return the water back to the river downstream. ROR projects are dramatically different in design and appearance from conventional hydroelectric projects. Traditional hydro dams store enormous quantities of water in reservoirs, sometimes flooding large tracts of land. In contrast, run-of-river projects do not have the disadvantages associated with reservoirs, which is why they have less environmental impact. A power station utilizing the run of the river flows for generation of power with sufficient pondage for supplying water for meeting diurnal or weekly fluctuations of demand. In such stations, the normal course of the river is not materially altered. Many of the larger ROR projects have been designed to a scale and generating capacity rivaling some traditional hydro dams. For example, the Beauharnois Hydroelectric Generating Station in Quebec is rated at 1,853 MW. Some run of the river projects are downstream of other dams and reservoirs. The run of the river project didn't build the reservoir, but does take advantage of the water supplied by it. An example would be the 1995 1,436 MW La Grande-1 generating station. Previous upstream dams and reservoirs are part of the 1980s James Bay Project. Like all hydro-electric power, run-of-the-river hydro harnesses the natural potential energy of water, eliminating the need to burn coal or natural gas to generate the electricity needed by consumers and industry. Moreover, run-of-the-river hydro-electric plants do not have reservoirs thus eliminating the methane and carbon dioxide emissions caused by the decomposition of organic matter in the reservoir of a conventional hydro-electric dam. This is a particular advantage in tropical countries where methane generation can be a problem. Without a reservoir, flooding of the upper part of the river does not take place. As a result, people remain living at or near the river and existing habitats are not flooded. Any pre-existing pattern of flooding will continue unaltered, presenting a flood risk to the facility and downstream areas. Run-of-the-River power is considered an "unfirm" source of power: a run-of-the-river project has little or no capacity for energy storage and hence can't co-ordinate the output of electricity generation to match consumer demand. 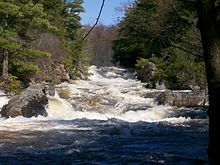 It thus generates much more power during times when seasonal river flows are high (i.e., spring freshet), and depending on location, much less during drier summer months or frozen winter months. The potential power at a site is a result of the head and flow of water. By damming a river, the head is available to generate power at the face of the dam. Where a dam may create a reservoir hundreds of kilometres long, in run of the river the head is usually delivered by a canal, pipe or tunnel constructed upstream of the power house. Due to the cost of upstream construction, a steep drop is desirable, such as falls or rapids. Small, well-sited ROR projects can be developed with minimal environmental impacts. Larger projects have more environmental concerns. In the case of fish-bearing rivers a ladder may be required and dissolved gases downstream may affect fish. In British Columbia the mountainous terrain and wealth of big rivers have made it a global testing ground for 10–50 MW run-of-river technology. As of March 2010, there were 628 applications pending for new water licences solely for the purposes of power generation – representing more than 750 potential points of river diversion. Diverting large amounts of river water reduces river flows, affecting water velocity and depth, reducing habitat quality for fish and aquatic organisms; reduced flows can lead to excessively warm water for salmon and other fish in summer. In undeveloped areas, new access roads and transmission lines can cause habitat fragmentation, allowing the introduction of invasive species. The lack of reservoir storage may result in intermittent operation, reducing the project's viability. ^ a b Dwivedi, A.K. Raja, Amit Prakash Srivastava, Manish (2006). Power Plant Engineering. New Delhi: New Age International. p. 354. ISBN 81-224-1831-7. ^ Raghunath, H.M. (2009). Hydrology : principles, analysis, and design (Rev. 2nd ed.). New Delhi: New Age International. p. 288. ISBN 81-224-1825-2. ^ a b c d e f Douglas T, Broomhall P, Orr C. (2007). Run-of-the-River Hydropower in BC: A Citizen's Guide to Understanding Approvals, Impacts and Sustainability of Independent Power Projects Archived 2008-08-28 at the Wayback Machine. Watershed Watch. ^ Knight Piesold Consulting. Plutonic Hydro Inc. Bute Inlet Project. Summary of Project Intake and Turbine Parameters. Knight Piesold Consulting. ^ a b Partha J. Das1, Neeraj Vagholikar. "Damming Northeast India" (PDF). Kalpavriksh, Aaranyak and ActionAid India. pp. 4–5. Retrieved 11 July 2011. ^ Plutonic Power (2008). Revised Project Description for Bute Inlet Hydroelectric Project Requirements. P1. Plutonic Power. ^ "Reservoir Emissions". International Rivers. Retrieved 8 February 2017. ^ Douglas, T. (2007). "Green" Hydro Power: Understanding Impacts, Approvals, and Sustainability of Run-of River Independent Power Projects in British Columbia. Watershed Watch. ^ Wilderness Committee. Wilderness Committee Comments on the Draft Terms of Reference, Bute Inlet Hydroelectric Private Power Project. Letter to Kathy Eichenberger, Project Assistant Director. P1. Wilderness Committee. ^ IPPwatch.com website. IPPwatch.com Archived 2011-01-13 at the Wayback Machine. Freedman, B., 2007, Environmental Science: a Canadian Perspective; 4th edition, Pearson Education Canada, Toronto, pp 226,394.